First-term U.S. 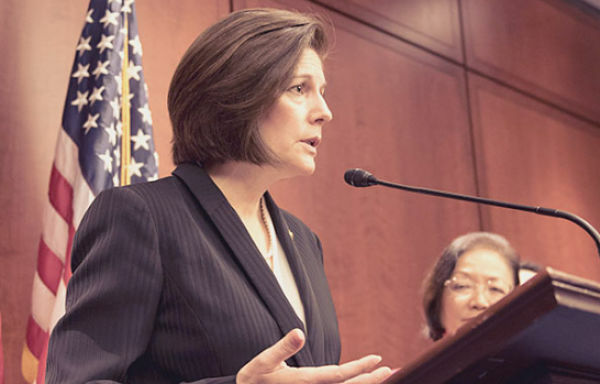 Senator Catherine Cortez Masto, shown at a different event, asked Tuesday how the National Sciecne Foundation dealt with funding threats. The focus was more on ‘competition’ than on ‘innovation’ Tuesday as the Senate Committee on Commerce, Science, and Transportation convened a hearing looking at the American Innovation and Competitiveness Act a year after its passage. The act, which among other things authorizes funding for the National Science Foundation and the National Institute of Standards and Technology, followed the lead of the much-loved America COMPETES acts of 2007 and 2010. Those bills saw both Republican and Democrats united in support of scientific research as a means to ensure a strong economy for the United States. Apart from those shots at the White House, which went unchallenged by the GOP senators present, the biggest target of the day seemed to be China. Various speakers portrayed China as threatening American dominance in research, the headline finding – “the U.S. global share of [science and technology] activities is declining as other nations — especially China — continue to rise” – in a recent National Science Foundation report. Addressing that for the committee were France Córdova, director of the National Science Foundation (NSF), and Walter Copan, director of the National Institute of Standards and Technology (NIST).Their views are particularly important for social and behavioral scientists given the outsize role, especially of the NSF, in funding basic social science research at universities. Nonetheless, social and behavioral science took a back seat to the technological sciences at the hearing, with nearly all the questions and testimony centered on STEM – science, technology, engineering and math – and not social science. Which is not to say the social science issues were never raised. They were, albeit obliquely at times. NIST will assemble a team with experts in cybersecurity, computers science, networking, human actors and cognitive psychology, and sociology to answer questions such as: What technical information does the public need and how can we make this information more understandable? Why don’t individuals practice safe computing? What societal factors influence the adoption of safe computing practices? Other questions were less directly behavioral but hit on key issues for the community, including reproducibility of research findings and research funding. Córdova’s response was politically neutral about how NSF sets its own priorities for grant-making from both bottom-up sources, such as its own decadal studies, and top-down directives, such as congressional suggestions. She was more vocal, however, when Gary Peters, a Democrat from Michigan, asked how the start-stop decisions forced by continuing resolutions and incipient shutdowns affect the NSF. She listed opportunity costs as a major loss, noting that the three Nobel Prize winners in physics for 2017 – all recipients of NSF funding in the past – are scheduled to speak to NSF staff on February 9. That is, unless the government shuts down again on February 8. To see Córdova’s written testimony, click HERE. For Copan’s testimony, click HERE. This entry was posted in Academic Funding and tagged NIST, NSF Funding, Senate. Bookmark the permalink. Post a comment or leave a trackback: Trackback URL.